First – we build a table with all the information we know so far. 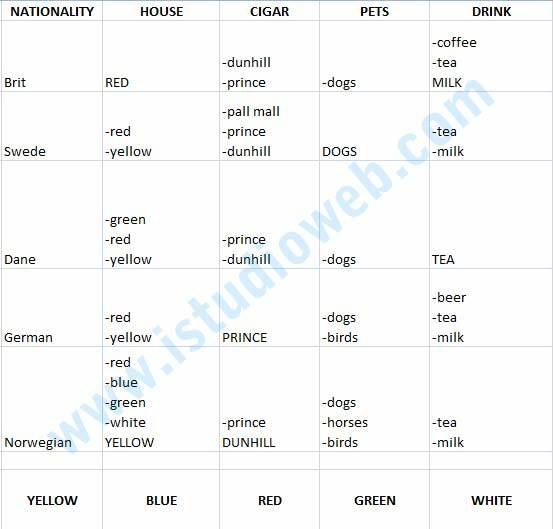 Of course, some hints will not fit this table, so we will add them below in a form of inter-dependencies. We will list other hints in a similar fashion (see picture below). Note, that some of the hints, like The man who smokes Blends lives next to the one who keeps cats are hard to depict like that, but the least we can do at the moment is note that man who smokes Blends DOES NOT own cats 🙂 So we will put these hints as negating hints. Note the minus sign in notation. Note that we have already started solving this riddle. 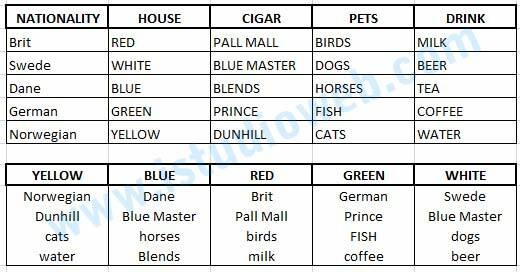 Look at the third line – we already know that owner of the yellow house smokes Dunhill AND does not own horses. That’s the way we will be solving this problem – by eliminating all the impossible scenarios. We have ignored a few hints so far, but don’t worry – we’ll get to them later. Next step in solving this would be to put all negating hints from other two tables into the first table. 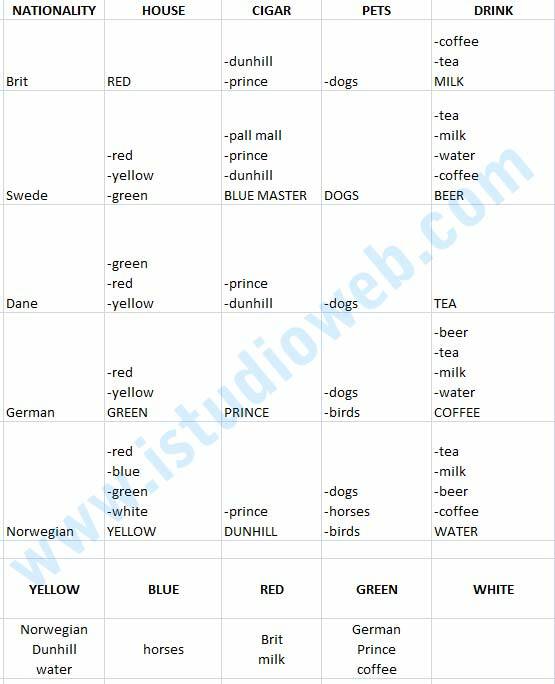 Let’s start with Brit – since he owns the red house he can’t be drinking coffee (it’s Green house owner’s prerogative) and can’t smoke Dunhill (it belongs to Yellow house). Using the same approach we can say that Swede doesn’t smoke Pall Mall (since he owns dogs). German, by the same rationale, isn’t drinking beer, since beer is tied in with Blue Master cigars. 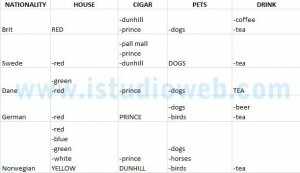 He also doesn’t own birds, since birds belong to Pall Mall smoker. Dane isn’t smoking Blue Master (tied to beer) and his house isn’t green (tied to coffee), since he drinks tea. 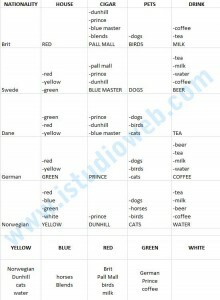 One more additional step here: to make sure we capture all impossible combinations, let’s note that since Brit owns red house – no one else can have red, no one except Dane can drink tea and so on. The result is the table below. See, it’s getting better! From step 3 we know that green and white houses are to the right of the blue (which is a second house on the street). This means that Norwegian, who lives in the first house, cannot live in neither one of them. Let’s add that to the table too. WAIT! We have just eliminated four out of five colors! OMG! 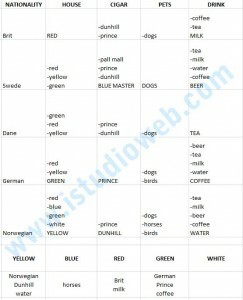 NORWEGIAN LIVES IN YELLOW HOUSE! WE SOLVED THE FIRST STEP! OMG!!! But let’s not stop here. 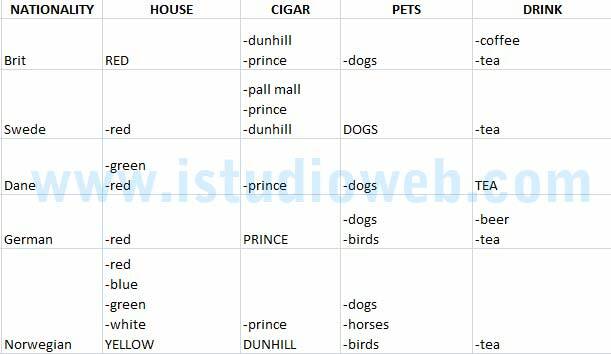 Look at the step 2 – we already know that owner of the yellow house smokes Dunhill and doesn’t own neither horses (hints 7,11) nor birds (hint 6) . Let’s add that too and see what’s going on. Now let’s look at our Norwegian friend again, since he’s the most telling. He smokes Dunhill, therefore he doesn’t drink beer. He also doesn’t drink coffee, since coffee belongs to the green house and he lives in yellow. This leaves out only one drink – water. Let’s put that into table and eliminate water from everybody else. Would you look at THAT! German’s DRINK column is now eliminating 4 possible choices leaving him with just COFFEE! But this immegiately means that German lives in the GREEN house (hint 5)! Oh, look again! Poor Swede is left with only one choice remaining for drinks – BEER! Which automatically makes him smoke Blue Master! Do you see how pieces fall into places almost all by themselves? Now let’s eliminate all the pieces we have assigned already from the rest of the choices. So far we know everyone’s tastes in drinks and we know exactly how houses line up on the street. Let’s look at hint 15 – the man who smokes blends has a neighbour who drinks water, who is Norwegian. But Norwegian has only one neighbour who owns a blue house. This means no other house can have Blends, so let’s eliminate it from those houses we have already established – German, Brit and Norwegian. But we already know what German and Norwegian smoke, so that leaves us with just eliminating Blends from the Brit. This leaves only one possible choice of cigars and that is Pall Mall. This means our Brit friend fancies birds. Let’s note all these facts in our table. 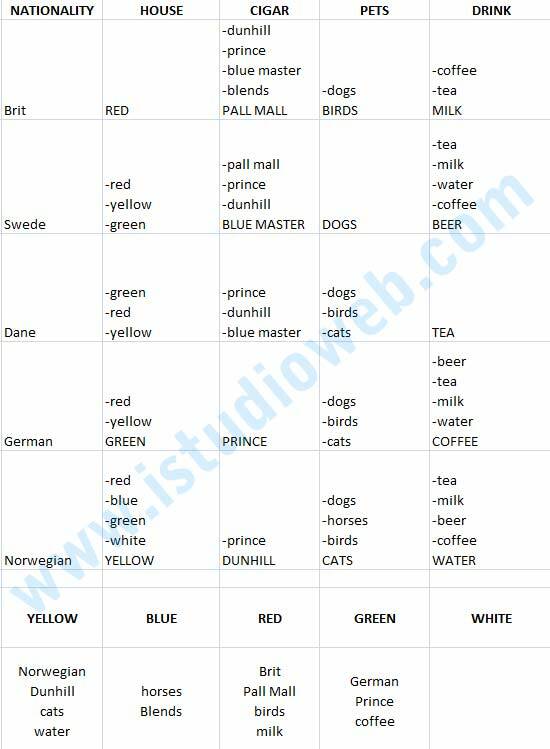 Notice that now we know everything about the Brit – or the Red house. Now let’s look at the hint 10. There are two neighbours to the man who smokes Blends (and lives in a Blue house) who might own cats – Brit and Norwegian. 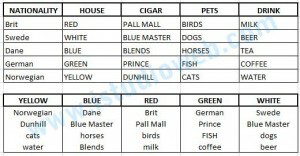 But since we have already established that Brit owns birds, this leaves Norwegian with Cats. Note that we now have full view on Norwegian as well – and about the Yellow house. We are almost done! hint 11 tells us that whoever lives next to man who smokes Dunhill (who is Norwegian) keeps horses. There’s only one neighbour to the Norwegian and that is a man in a Blue house. This means no other house can have horses, so let’s eliminate that from the German’s list. This leaves him with only one possible alternative – FISH! Problem solved!